For our 475th Soundtrack of the Week we're listening to the score for a film that's based on a song. 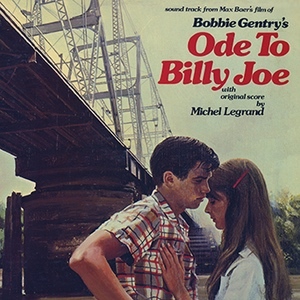 Since it isn't Convoy it must be Ode to Billie Joe, based on Bobbie Gentry's hit pop ballad and with music by Michel Legrand. The first track on the CD is the title song, which is still powerful and compelling and mysterious after all these years and the dozens of times I've heard it. I'm pretty sure I'd hate to see the movie. I don't know anything about it, even whether it's supposed ot be good, but the last thing I want is to be told what really happened on Choctaw Ridge. Legrand wrote extremely romantic music for the film, driving the plantive melodies with expressive piano playing surrounded by lush string arrangements with flute sometimes answering the piano's call. Most of the cues make use of one achingly longing theme, which occasionally recalls "As Time Goes By", one of Hollywood's most memorable and effective love songs. lso on the record are some other numbers, presumably source music: Thurman Box's uptempo bluegrass number "Magnolia Turn-Around", Hoyt Ming's fiddle rendition of "Rattle Snake Daddy", Morgan Gilmer's "Standing Pine Breakdown", "Memphis Thelma" by Sherrill Parks and an instrumental version of the title song.